Peter Fields has captivated audiences in the U.S. and Europe with his mastery of diverse musical styles and unique approach to guitar techniques. In addition to his sophisticated original compositions, his repertoire ranges from classical guitar, Jazz, and Latin music masterpieces, to extraordinary arrangements of R & B classics, and interpretations of ethnic music from various parts of the world. He can be heard on numerous recording projects on Polygram and various independent labels, and on television programs for Fox, National Geographic, Discovery Channels and others. His performances as finalist in the American Fingerstyle Guitar Festival and the National Guitar Championships and the winning of first prize in the Mid - Atlantic song contest established his position as a fresh, new voice in the world of virtuoso guitar music. He has composed scores for film and received commissions from choreographers to create original music for the ballet and modern dance. Most recently he collaborated with the noted Pakistani choreographer Tehreema Mitha on a cross-cultural project for her dance company. 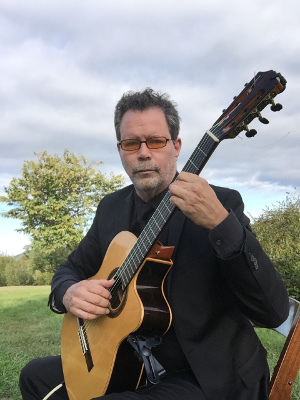 He has performed on the Washington Chamber Symphony recitalist series, released an album of his compositions entitled Solo Guitar Music, which was selected as best acoustic album of the year by Northern Virginia Rhythm, and been nominated as Best Jazz Instrumentalist by the Washington Area Music Association. In January of 2003 Peter released Stillness of the Heart, an evocative collection of compositions for classical guitar which has received rave reviews and airplay throughout the country. Peter’s melodies are beautifully complimented by the virtuoso keyboards of John Drymon and the visionary percussion of Grammy nominated artist Raphael Cruz. Eleven songs from Stillness of the Heart were chosen to be included in a compilation called Guitar Escapes, released through a national retail chain in 140 locations in 15 states.